Profitability report shows how much money you've earned vs. how much money you spent so you can see how profitable you are. 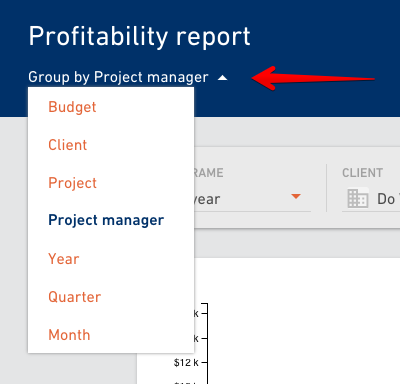 Go to the Reports tab in the main navigation and select Profitability report. You can build a report using various criteria: timeframe, client, project, project manager, budget type and tags. Select a time interval for which you want to get a report. If you leave everything else blank you'll get an overall report in the selected time frame for all clients, projects, project managers and budgets. The report can show open budgets, closed budgets or both. 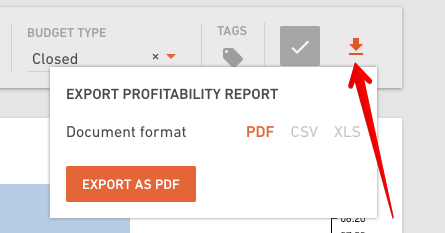 If you have tagged your budgets, you can create a report based on those also. When you set all the criteria, click on the green checkmark button to run the report.